After West Bengal and Tamil Nadu, it is time for Andhra Pradesh to provide financial assistance to the unemployed youth. Nearly 12 Lac unemployed young people are there in the state of Andhra Pradesh. Each person will get up to Rs. 2000/- per month until he/she gets a job. Age: The scheme has been launched for the unemployed youth of the state. The candidate must not be older than 40 years and must not be younger than 18 years. Qualification: According to the rule of the scheme minimum SSC passed students who are unemployed can get the benefit of the scheme. Under this scheme intermediate, graduates and post graduates will also be eligible. 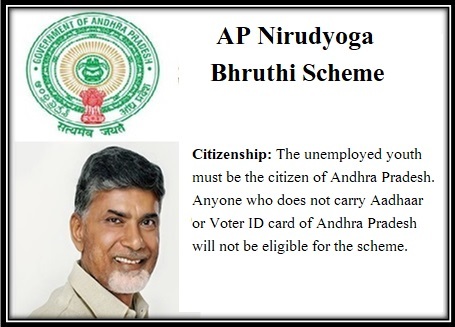 Citizenship: The unemployed youth must be the citizen of Andhra Pradesh. Anyone who does not carry Aadhaar or Voter ID card of Andhra Pradesh will not be eligible for the scheme. Preference: The eligible candidates must be enlisted under the Andhra Pradesh Employment Exchange. Those who have already enlisted their names will get the benefits first. Those who are registered under Employment exchange for more than 5 years will be preferred. As per the statement of Mr. Kollu Ravindra, the entire unemployed population in the state will be divided in different categories according to their qualifications. Those who have completed post graduation but failed to find a job will receive Rs. 2000/- per person per month under Unemployment Allowances Scheme, Andhra Pradesh. Those unemployed people who have completed graduation and could not get a job will get Rs. 1500/- per month per person as allowances until he/she gets a job. Intermediate passed students will get Rs. 1000/- per month per person under this scheme. Also SSC passed people will get benefits under Unemployment Allowances Scheme but they will not get any financial help from the state. Allowances will be given to only one member of each family. If there are more unemployed in a same family, only one person will get the allowances under this scheme. This scheme has launched to facilitate the unemployed youth of the state. Along with financial assistance the scheme will also provide skill development programs to the young people to enhance their practical knowledge. Before starting up the scheme officially the Andhra Pradesh state government will take West Bengal and Tamil Nadu‘s schemes into account for more depth. AP government is providing higher amount of allowances than these two states. This scheme will provide unemployment allowances for 2 to 3 years. Within this span of time person gets a job. As of now no news has come out what will happen if the person will not get job after 3 years. However whichever is less will be taken into consideration. Under this scheme the state government will generate more job opportunities for the youths. According to their qualification they will be provided skill development courses. This will help them to take up complicated jobs. If any unemployed beneficiary would like to take up community jobs under state government can do that anytime. In that case the person will not get allowances until he / she is in the community job. Initially the state government has allocated Rs. 500 Cr for the scheme. Already Rs. 390 Cr (Approx) has been allocated to the skill development program in the state. Any employed person – It has been mentioned clearly if any person is associated professionally with the government or private sector, and receives any salary, then he/she will not be entitled to receive this redundancy grant. How can one apply for the scheme? The officers of the state employment department will check the data mentioned in the official documents, submitted by the applicant. They will conduct verification of these papers to check its validity. They will also get in touch with officers of the Employment Exchange, to double check the validity of submitted papers. Once this is over, applicants will be able to register under the unemployment stipend program, either via online or offline modes. If any person is interested in online application, then he/she needs to click on the official link of Andhra Pradesh government. The link address is ap.gov.in. From where can one get the application form? Any interested and eligible person will be able to apply for this scheme by filling the online application form. In case, one needs to download the application form that is also possible from the authorized portal.